Everybody is arguing about “Tiger Mothers” these days … but are they having the right argument? The trouble with the debate sparked by Amy Chua’s book is that it assumes that the only relevant questions in parenting are: how authoritarian are you? There’s no question Chua went over the top: when she writes about forcing her children to sit for hours with threats of no food, no water, no bathroom, until you perform perfectly … doesn’t that sound like torture? But there’s also no evidence to suggest that lax parenting is a good thing. Authoritarian … permissive … is this really what matters in how happy and well adjusted children become? A recent study out of Hong Kong suggests it’s not. This 2010 longitudinal study of 346 Hong Kong 7th graders found that the degree to which 7th graders thought their mothers cared about them was more relevant to their long-term life satisfaction than how strict their mothers were. In other words, how “authoritarian” and “permissive” mothers were didn’t actually matter all that much – but their relationship with the child, how loved the child felt and how much the children thought they mattered – was pretty important. Both Amy Chua and her detractors may have missed the point. Carl Rogers, on the other hand, got the point quite some time ago. Humanistic approaches to parenting, based largely on his work, are centered around empathy and the recognition that children are individuals. It’s natural that some children will thrive more with discipline and some with freedom … they’re unique human beings. What they do need, under any circumstances, are parents who are fully present to their voice and needs. That doesn’t mean “giving them what they want” – the whole point is that we’re not arguing about how permissive to be. But being empathetic to children, whether or not you’re giving them what they want, allows parents to become more emotionally engaged in their child’s life. It’s certainly good practice for parents to set boundaries, make sure their kids are aware of the responsibilities that come with making choices, not ignore irresponsible behavior. But exactly where the boundaries are is less important than the emotional connection parents have with their children through good times and bad, and that the child know they are loved. Being a parent is hard, it’s work and certainly not for the meek. 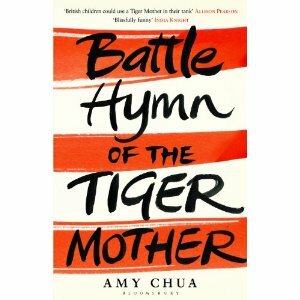 In a way, Tiger Mom is an aspiration for Chua and other’s to be the best mother by creating the best children. But parenting is more than just a checklist of how to’s … it’s a deep connection with another human being.